Whether you bake artisan bread, pastries, cookies, cakes, pies, donuts, bagels or soft pretzels, we offer everything you need to run your bakery—thousands of different items from ingredients and ready-to-use bakery products to a wide variety of frozen baked goods. After all, Lentz has been the “main ingredient” for local bakeries throughout the Mid-Atlantic region since our founding in 1942. We carefully select the suppliers we work with to “bring the best to bakeries” by offering a broad range of competitively priced products that deliver a superior combination of quality, consistency, and convenience to the bakery operator. Our product line continues to evolve in response to our customers’ requests for clean-label ingredients, organic ingredients, and new types of “better-for-you” ingredients. At Lentz, we view our customer relationships as partnerships based on our deep understanding of the needs of retail bakery operators. 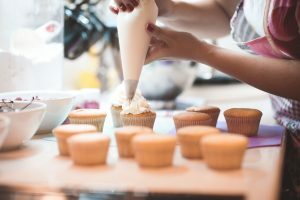 Our experienced sales and customer service teams works closely with our customers to suggest new products, provide seasonal merchandising ideas, and deliver technical assistance to help trouble-shoot problems in the bakery or test new production techniques. Through the assistance we provide, we continually strive to help our customers grow their sales and adapt to changing consumer preferences. Our extensive product line of quality products and consultative customer service is backed by an unmatched level of reliability. With our high standards for food safety and nearly perfect fill rate and on-time delivery performance, we take the worry and hassle out of the purchasing process, allowing you to focus on running your bakery and serving your customers.